Developers aim to make a place of ‘ambience, fiber and essence’ - The Resident Community News Group, Inc. | The Resident Community News Group, Inc.
Perhaps no one agrees more with Rummell than the Downtown Dwellers, a group of downtown residents who banded together a few years ago to build a sense of community among those who reside in the sparse residential developments that lie on Jacksonville’s Northbank and Southbank. It was standing-room-only when more than 200 Downtown Dwellers and their guests crowded into the large ballroom at the Omni Jacksonville Hotel Jan. 7 to listen to Rummell and his partner, Michael Munz, both of San Marco, join Jaguars President Mark Lamping, overseer of Shad Khan’s downtown mixed-use initiatives, and District 5 City Councilwoman Lori Boyer describe City projects underway Downtown this year. Khan’s Northbank initiatives, which include revitalizing the shipyards area near TIAA Bank Field, will do much to “stabilize” the Jaguars as a team, Lamping said. “When Shad Khan purchased the Jaguars, it was evident to us that the franchise will only go as far as Downtown Jacksonville goes. We realized early on, if we are not focused on bringing more people to Downtown, not only as visitors, but also as employees and residents, we will probably fall short of our goals,” he said, noting his firm is aligned with the City in its focus to bring economic strength downtown. Lamping said Khan’s development will begin this year in Lot J, a large surface parking lot with 1,400 spaces west of Daily’s Place near the stadium, and noted there will be five parts to the first phase of its development. First, a large surface parking structure above the retention pond that is just west of Lot J will be built. “It would be a very large structure because there is a need to replace the parking currently held in Lot J and also to provide some parking for the developments that follow,” he said. Lot J would be divided into four quadrants – ideally two quadrants will provide office space, each with a major employer on site to bring activity to the area 365 days a year. An alternative might see one quadrant with office space and one quadrant of residential. The remaining two quadrants would provide an entertainment district with restaurants, shops and amusements to complement the stadium, baseball grounds, and Daily’s Place, as well as a hotel. “We have initiatives that are underway in each of these four quadrants, and we are excited to have a great development partner in this first phase, Cordish Companies,” he said, describing Cordish as the “perfect partner,” with similar urban/sports center development experience in Kansas City, St. Louis and Baltimore. Khan’s second phase will depend on what Jacksonville chooses to do as it relates to a convention center. “If there is a decision at some point in the future to build a convention center, we have a great location at the base of the St. Johns River,” he said. Part of Khan’s master plan shows a convention center on the Metropolitan Park site as well as a large five-star hotel and a renovated and remodeled marina, allowing for day traffic and permanent nautical boarding opportunities. “I don’t think it is any secret that Shad is really interested in bringing a Four Seasons [Hotel] to Jacksonville,” Lamping said, noting the Jaguar’s owner already owns the Four Seasons in Toronto. The third phase to be built will be residential units on the parking lots north of Lot J. “Hopefully, if this is successful, we will be able to develop a nice sustainable neighborhood to encourage even more involvement on the Northbank between the Hyatt [Hotel] and the Sports Complex,” he said. Lamping also added he hopes the city will relocate its downtown correctional facility away from the riverfront. 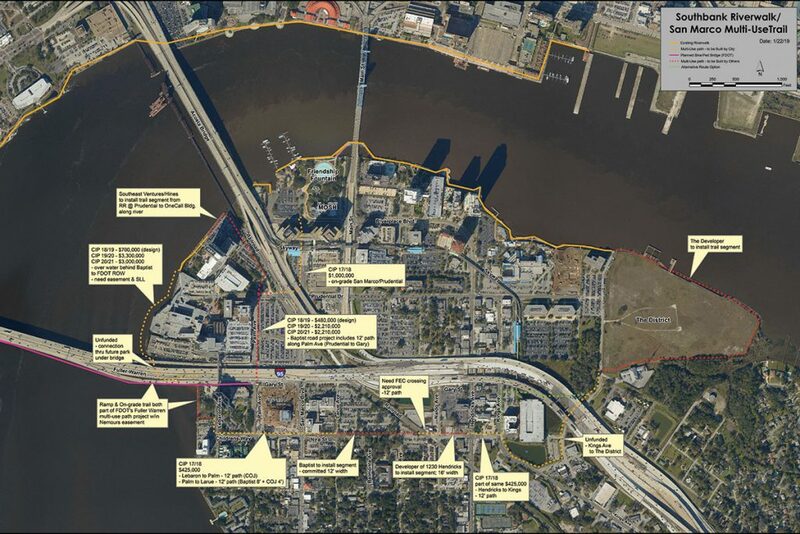 The existing Southbank Riverwalk (solid yellow line) will be extended by the City of Jacksonville and adjacent property developers. Although Lamping’s projects are often perceived to be in competition with The District, nothing could be further from the truth, said Rummell. “Everybody tries to convince me that we’re enemies, that we are competing with each other, but I wish Mark was done by at least half or all the way done because the more that happens in Downtown, the better off we all are. I wish him nothing but the best of luck and that all this happens sooner rather than later,” he said. The District is scheduled to break ground in May or June 2019, said Rummell. “We think it will take about two years – ‘til summer 2021 – when you will be able to have a drink on a very cool bar in The District,” he said. At this point, The District, a 30-acre, Southbank multigenerational development designed for healthy living, will consist of 1,170 residential units for rent and sale, 150-200 hotel rooms, 288,000 square feet of retail space, 150,000 square feet of office space and a 125-slip marina. First to be built will be an AC Marriott Hotel, which is under contract. The marina is currently at the “Army Corps of Engineers stage,” which is an 18-month process, said Munz. Eventually, townhomes will face the wooded area at the back of the complex, and the Riverwalk will front the development, which will include a four-acre, riverfront public park. A wooden boardwalk will join the Riverwalk, encircling the backside of the development, allowing residents and visitors to walk around the entire site, Munz said, adding it’s a nine-mile walk when you consider both the Northbank and Southbank Riverwalk and the walking path around The District. “What other city in America has a nine-mile linear park that covers two sides of the river where you can walk, bike, take a water taxi, and, as I understand, JTA (Jacksonville Transportation Authority) is talking about having an autonomous bridge that could go back and forth. This is a spectacular opportunity for us to have a Northbank and Southbank connect like no other city has,” Munz said. Also included in the plan is a second “front door,” a road connecting the development with the I-95 interchange. “Peter often wants to take full credit for the I-95 exchange design, but it really is great for us, because you can quickly get on I-95 behind the project or enter from Prudential Drive,” Munz said. In answer to queries from residents posed by Boyer, both the developers said they were not concerned about flooding on their properties, adding the developments will be specially designed and “engineered” to take excess water into consideration. Rummell said his site had little standing water during Hurricane Irma because JEA had added fill and made the property higher when it conducted its $28 million soil remediation a few years ago. Residents in adjacent neighborhoods should not worry that The District will add to flooding woes in their areas, he said. In order to draw more visitors to Downtown and make the area more exciting for residents, the City is planning to install a Wallcast Outdoor Venue in the area near the Times-Union Performing Arts Center, said Boyer. The installation includes livestreaming of symphony, theatrical performances and movies on the sides of the performing arts center and the CSX building and will be modeled after Soundscape Park in Miami Beach. The parking area near the Times-Union Center will be created into a Performing Arts Garden, a lawn area with “informal and unstructured” seating. Speakers will ring the edges of the lawn allowing movies and visual features to be projected from the garden’s rear onto the side of the CSX building, Boyer said, adding that the appropriation for the new garden was being considered by City Council. Another element which will augment the performing arts center enhancement will be the construction of a Northbank Riverwalk Riverfront Visitor Center, located at the corner of the performing arts building that is closest to The Landing. Its appropriation is currently being considered by City Council. Perhaps most exciting will be a nightly multimedia show, with 360-degree visuals that will beam off the Main Street and Acosta Bridges, Friendship Fountain, the CSX building and the Performing Arts Center, that is being currently developed by Miller Electric, TLC and the Moment Factory of Montreal, said Boyer. “I have been looking for about a year to find the right kind of multimedia company that will do public spaces,” Boyer said, noting they have done public installations throughout the world as well as shows in amusement parks and at the Super Bowl. The three companies are engaged in developing the show’s concept, cost estimates, hardware and software specifications as well as operating cost estimates, she said. The multi-site show will include stories about Jacksonville told through a “chronology of rhythms.” The synchronized light and projection visuals will also incorporate audience participation through clapping, and a seven-act sequence might include the themes of ecological (connections between citizens and ecosystems), indigenous (Jacksonville’s pre-colonial history and traditions), beat ( movement of people and trade along the river), train (ways the train replaced river travel and changed the cultural landscape), musical (Jacksonville’s rich musical traditions throughout the ages), sports (civic pride in play and competition), and military (a source of employment and sense of pride). The four sites will light up in synchronicity to reveal a unified story for the set duration. Each show can be viewed one site at a time, where the story is discovered through a new perspective with each visit or viewed through multiple sites throughout the duration of one show, Boyer said.